Dawn. 52 degrees. Brr! What happened to that heatwave? Not to worry, it warmed up by the time we got going. I picked up MH (we live about a block from each other) and we headed out to Winchendon to meet up with Melaney for our relay for Mass State Tri. 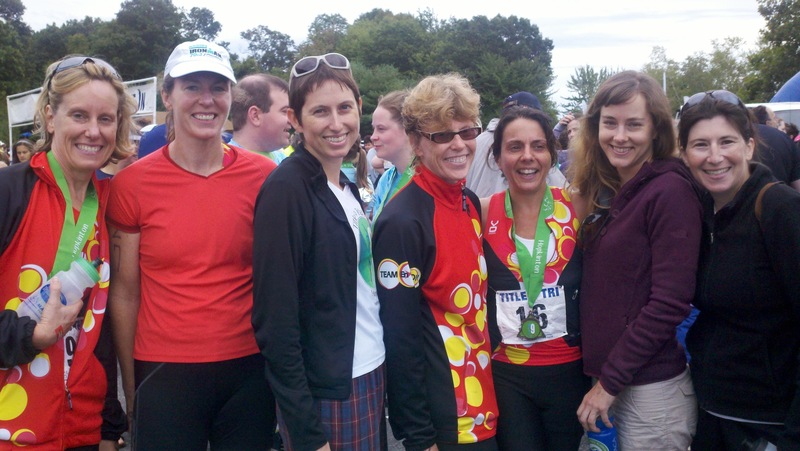 We were joined by TE teammates Margaret and Fran (doing the full Olympic tri) and Cathy (aquabike): a pretty nice team showing! It was a beautiful, if chilly, morning with wispy mist rising off the water. I was a little worried that the start would be delayed, but the mist dissipated pretty quickly and we were left with a bright, clear day. After a reading of 80 degrees on Saturday, the Sunday morning water temperature check said 77 so it was a wetsuit legal race (although I think they must have gone to great lengths to get that temperature – the water was warm). We were in wave 2 – relays are NEVER in such an early wave. It was great! I shot off and managed to swim one of my best times. Maybe wetsuits aren’t so bad after all! 22:52 for the .9 mile swim. Chip handoff – thanks to MH for making the transfer from my ankle to Melaney’s – and Melaney hit the road for a quick 22-mile ride at 19.2mph! Wow! She was back well ahead of when she told us to expect her. Way to ride! Quick T2 and MH pulled off a speedy 48:41 for the 10k run. That’s a blazing 7:52/mile pace and a personal best! Given all that, it was no surprise that we were 1st in the female relay division! Yippee! Since I was only swimming, I got to watch and cheer. 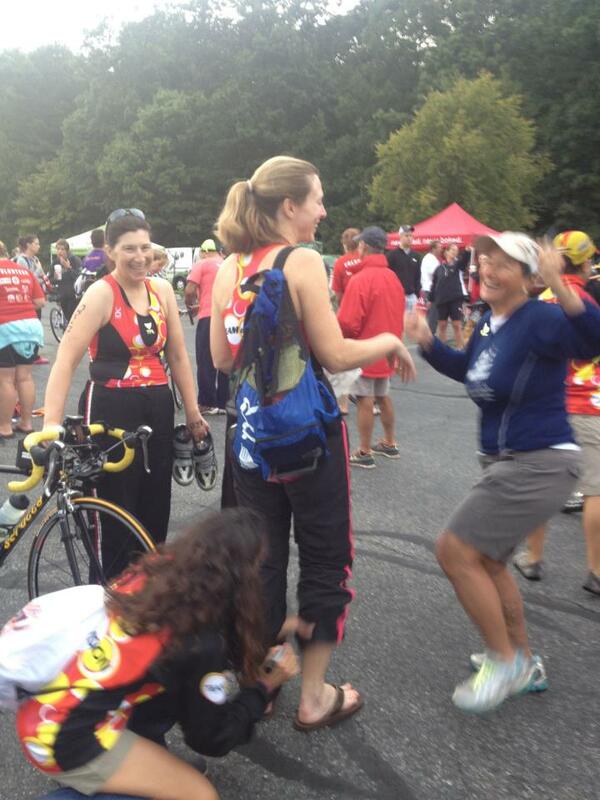 It was fun to see everybody going from swimming to biking to running (except aquabiking Cathy) to finishing! It’s always uplifting to be with such strong athletes. 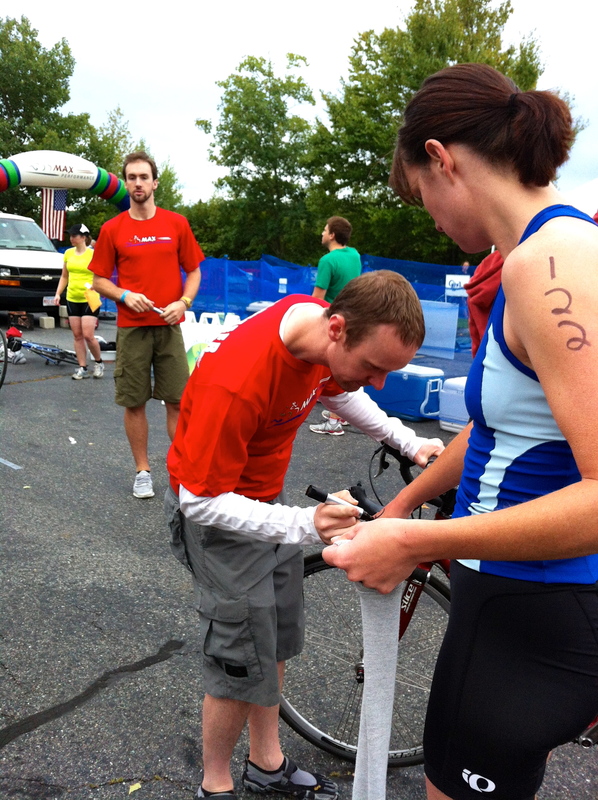 The Sharon Triathlon is one of my favorite sprints put on by Max Performance. The pond is usually calm, and the ride and run are quite flat and fast. For an August race, this one is also a great choice as the bike and run courses go around the pond and are mostly shaded and breezy. It’s an interesting sprint in that the swim is a full ½ mile, the bike is 12.3 miles and the run is longer than usual at 4.4 miles, favoring those who are happiest running. There is one more unusual aspect of the Sharon Tri – there has been an Aquabike division for the last couple of years. Another perk Max Performance provides at this race is a tent with post-race massages: sign-up as soon as you finish as it’s first-come-first-served! I chose to race the Aquabike this year due to running injuries and enjoyed being able to go as fast as possible during my ride without having to save energy for the run. I was quite pleased to come in 3rd in my division even though I had a slow swim split. 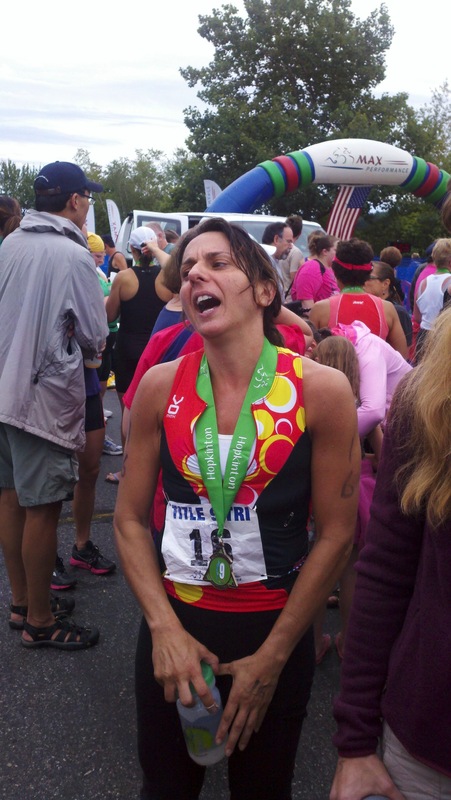 Sharon Perl Olshvang and her daughter Riley Perl both raced the triathlon. Congratulations Riley for earning 3rd place in the under 19 division. We’d love to have you join Team Envision this year! I highly recommend the Sharon Triathlon and hope more of us register for it in 2018. It’s a great event. 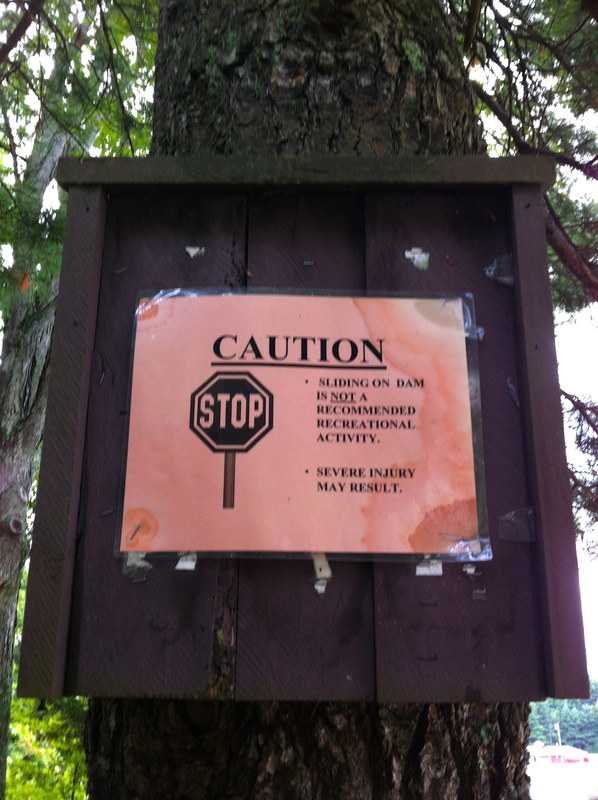 I attended the Buzzard’s Bay Sprint Triathlon as the runner in the relay with Z and Ruth. The morning started off cloudy but the sun came out in full force by the time I was running. There were strong winds in the morning, and the race volunteers couldn’t keep the swim buoys out in the water! It appeared to be an advanced and unpleasant swim, partly due to the weather that day. But also given that it’s an ocean course requires some solid swimming experience. The staff were recommending that anyone not comfortable switch to the duathlon. I probably wouldn’t feel comfortable swimming at Buzzard’s Bay even on a nicer day! The run was very pleasant with pretty and changing scenery… down a road, by some Cape houses, out and back to Gooseberry Island, and then through a camp ground. My most notable practical observation is that there was really no shade or cover anywhere on the run course. I put on sunscreen (a must!) but would also have a visor or sun glasses next time. 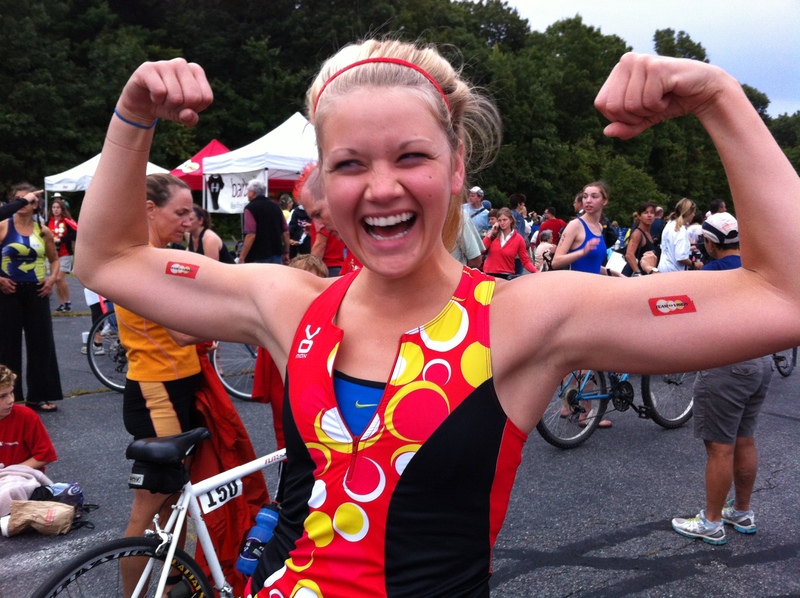 A strong start to 2016 triathlon season! Team EnVision showed up in force for the Max Performance Season Opener Du Tri 2016! We had athletes racing in both the duathlon and the triathlon, plus a few more volunteering and cheering. Anticipating cold water on race day, a few of us headed to Walden Pond on Saturday for a test swim. The water was chilly, but the air was warm and the sun was shining. Really, it was a perfect day for an early season swim. In true New England fashion, the weather changed overnight and delivered us cool air, a cloudy sky, and heavy winds on race morning. Melaney and the other duathletes started first with a 2-mile run, and then the triathletes walked down to the swim start. The Hopkinton Reservoir was a refreshing 59 degrees. The water was choppy due to the wind, but the current was flowing toward the swim finish line. We donned our wetsuits, doubled our swim caps, and were ready to race! The 10-mile bike course featured rolling hills through the Hopkinton State Park and surrounding communities. The course was well-marked and had plenty of volunteers. The long hill at the end can be a bit of a challenge, but the runners heading out on the other side of the road provided much-needed encouragement. The run course took us back out for a 5K through the park. Crossing the causeway, we were treated to strong wind gusts and a glimpse of the finish area. From there, it was just a quick turn past the beach to the finish line! As always, Max Performance hosted a well-organized event. It was a great day and a successful start to the season for Team EnVision. 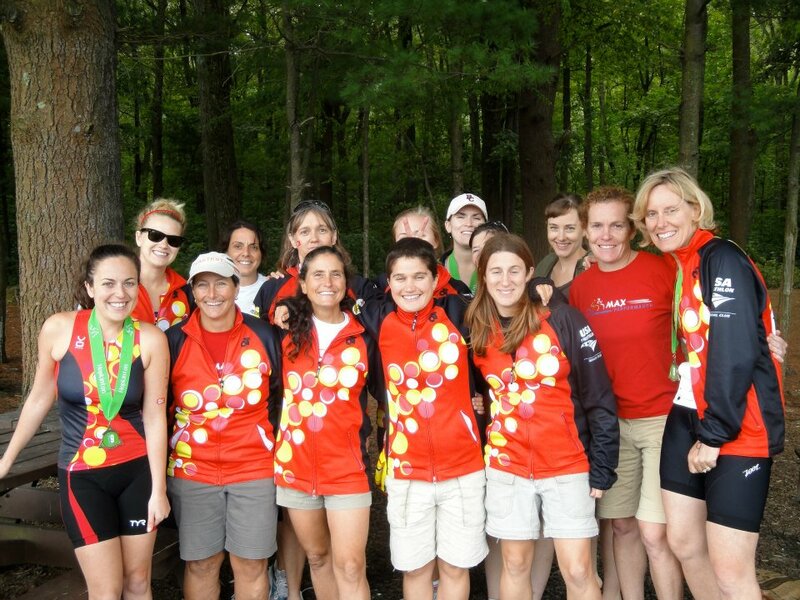 We look forward to conquering this course again in September at the Title 9 Women Only Spring Triathlon! Title 9 was a success! The volunteers started out by body marking….you can see we have fun no matter what task we are given. Once the body marking was done we were all divided up to go man our stations along the route. 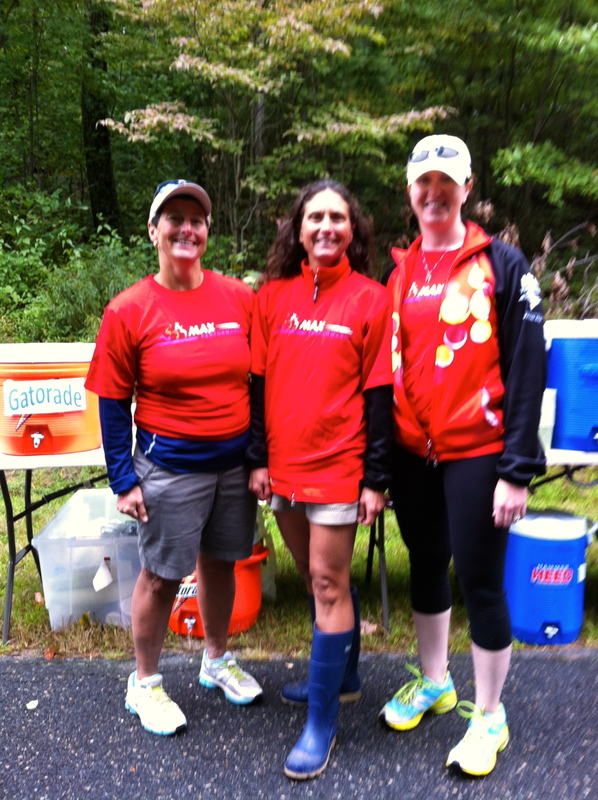 Some of us were directing racers, others were delivering much needed hydration, and, of course, everyone was cheering! The race finished off with a great BBQ by the TE members. Lots of goodies to eat after a hard morning’s work! A great group of racers and volunteers!